This popular and historic railway carries passengers via biodiesel engine or vintage steam engine with replica coaches up a three-mile-long trestle to the 6,288-foot summit. Here you’ll see the surrounding national forest’s brilliant hues from some of the steepest railroad tracks in North America (37 percent grade in one stretch). On the ride up, the landscape and foliage change with the elevation. From the summit, you can take in panoramas of the mountains and valleys from New Hampshire to Vermont and, on clear days, as far as Maine and Canada. The Hobo Railroad is celebrating election season with a cornstalk exhibit called “Scarecrows of the Oval Office.” This is the Railroad’s third year showcasing the critters, which are on display every day until 3 p.m. at no charge.Some of the Oval Office scarecrows are George Washington, Abraham Lincoln, John F. Kennedy and family, Richard Nixon and Ronald Reagan. Both major party presidential candidates are also on display with the pseudonyms Celery Clinton and Donald Stump. Trains depart daily from Lincoln at 11am & 1pm. On the notch train, you’ll travel on tracks that were laid in the 1870s and enjoy some of the most dramatic natural scenery in the East as you travel through spectacular Crawford Notch – past sheer bluffs, steep ravines, cascading brooks and streams, and panoramic mountain vistas. Live commentary onboard includes history and folklore of the railroad and area, as well as points of interest. Leaf peepers will soon fill New Hampshire’s roads as they flock to witness the turning of the leaves, but we know an even better way to experience this beautiful season than through the windshield of your car. The cool, crisp air of autumn is ideal weather for hiking and the riot of color offered by the fall foliage is the perfect backdrop. Lace up your boots, get outside and find some of the best views in New England with a hike in the White Mountains that promises big foliage payoffs. If you prefer to start off slowly, the Lincoln Woods Trail is convenient and an easy hike (visitor center at the trailhead at SR 112 Kancamagus Highway) that runs for 2.6 miles along the east branch of the Pemigewasset River. For more of a challenge, you can combine the trail with other trails that run through the forest in the White Mountains, just northeast of Lincoln, including the Black Pond Trail and the Franconia Brook Trail. Together, the trails offer scenic mountain views, a beautiful waterfall and woodland adventure. The New Hampshire Appalachian Mountain Club offers some great events for various ages and families, including guided hikes that are an excellent way for new hikers to give it a try. In addition to the indoor and outdoor swimming pools at Woodwards Resort, the Lincoln area boasts several local swimming spots that locals and visitors love on hot summer days. A great spot to gently float down the river on inner tubes, The Lady’s Bathtub is a natural swimming area in the east branch of the Pemigewassett River. There are shallow and deep areas for a swim and a small sandy beach. Large river rocks are fun to climb on, or to sit and relax on as the river gently flows by. The closest river swimming area to the Village of Lincoln, enjoying The Lady’s Bathtub, is the perfect way to spend a summer afternoon. Echo Lake Beach visitors can enjoy the beauty of a 28-acre Lake with an excellent view. The slopes of Cannon Mountain ski area drop right to the edge of the lake, and the view highlights where the Franconia Range and Kinsman Range meet, creating the notch. The beach is open from 10 am to 5:30 pm daily from June 15th to Labor Day and canoe and kayak rentals are available. Mirror Lake is a natural spring-fed lake just outside the town of Whitefield in western New Hampshire. The lake straddles two of New Hampshire’s tourism regions: The White Mountains and Great North Woods. It has an average depth of eight feet and a maximum depth of 23 feet. It is a great lake to explore by canoe or kayak, windsurf, or simply enjoy the sandy beach for swimming and sunbathing. We’ve got train rides with a kick! From the rustic Cog Railway up Mt. Washington to the luxurious Cafe Lafayette Dinner train, the White Mountains offer train experiences to meet just about every type of adventurers desire. Recognized as one of the nation’s premier dinner trains, The Cafe Lafayette Dinner Train offers a five-course dinner and spirits served in the Grand European manner while you ride in one of three beautifully restored Pullman dining cars. As dinner is served, period music keeps time with the rail’s rhythmic rumbling, punctuated by the haunting wail of the engine’s whistle. With magnificent mountain vistas and lush New England forests surrounding, you are assured of having the best seat in the house, all evening long. If you’re looking to escape the ordinary and relive the romance of dining on the rails, we’re confident that the Cafe Lafayette will provide a dining experience far beyond your expectations. At the other end of the adventure spectrum, Clark’s Trading Post offers a “steam powered journey through history” but warns to beware The Wolfman who has been trying to keep visitors away from his secret mining operation for more than 30 years! Keep your eyes open as the train passed through the woods during the 25-minute tour, because the bushy-faced miner is likely to emerge from the thickets and play all kinds of ornery tricks and he chases the train. Luckily, he’s afraid of heights and water so when you reach the covered bridge, you know you’re safe! This is a fun adventure for the whole family! Come see what’s cooking at Woodwards’ Grille this summer. We’ve got some fun and fabulous new breakfast items, including just about every kind of Eggs Benedict you can think of, and Woody the Woodwards Woodchuck plans to visit regularly to get the kids to join him after breakfast by the pond to feed the ducks! And, now that the temperature is moving north, we’re excited that the Pub Deck overlooking the Pond will open this week too, just in time for the Memorial Weekend kickoff to summer. We’ve been cooking up new menu items like Sweet Chili Shrimp and Jalapeno Toasted Raviolis (to name just a couple) that pair fantastically with a cold beer on a warm day. We’re pulling out all the stops and rolling out the red carpet for summer. So, whether you’re bringing the whole family, or having some one-on-one time with someone special, the new Grille at Woodwards Resort has something just for you. Check out The Grill at Woodwards menu’s here. /wp-content/uploads/2017/12/logo.png 0 0 admin /wp-content/uploads/2017/12/logo.png admin2016-05-25 00:00:002016-05-25 00:00:00The Grille Opens Today! Spring has sprung here at Woodwards Resort & Inn! This time of year is a fantastic time to hike & bike throughout the area without all the crowds. A walk in the woods may afford the chance to catch a glimpse of local wildlife emerging throughout the State and National parks. Come on up and play! We look forward to your stay with us! New Hampshire designated the white-tailed deer as its state animal in 1983. There are frequent sitings of fawns, such as this one, in spring. Photo courtesy John J. Lagoulis. http://www.woodwardsresort.com/wp-content/uploads/2017/12/white-taildeer.png 351 347 admin /wp-content/uploads/2017/12/logo.png admin2016-04-23 00:00:002016-04-23 00:00:00Spring Has Sprung! The New England Brewfest, held just down the road at Loon Mountain, is a unique blend of beer-infused social events educational workshops, and a signature tasting event called Saturday Night: ON TAP. New Hampshire is home to dozens of craft brewers who will turn out to share more then 100 blends of their tasty treats. In addition to the On Tap tasting, events include a 2-hour train ride along the Pemigewassett River the features food and beer pairings; “Hop Talks” where New England’s premier breweries offer samples and information about their handcrafted, signature beers; and, Believing Brewers, a non-denominational service at the top of Loon Mountain. Minister Marcus Corey and guest speaker Rev. Jon Paul will discuss the connection between beer, history, culture, and religion. Woodwards looks forward to being your Brewfest Weekend Headquarters. Give us a call today to reserve your room. P.S. All Brewfest events are for adults 21+. We’re Getting Ready to Play this Summer! We know the warm weather is slow to show up this year, but it isn’t too early to start thinking about getting that bike out and making preparations for NH’s June bike week. Can’t you just feel that mountain air blow through your hair and the wonderful feeling that summer has arrived…ahhh. From its beginnings 100 years ago at Weirs Beach on Lake Winnipesaukee when a few hundred motorcyclists got together to share their enthusiasm for riding, to today’s week-long bike rally with more than 300,000 riders taking the state by storm, NH Bike Week is not to be missed by motorcycle enthusiasts from around the country. New Hampshire offers unmatched scenic motorcycle riding throughout our beautiful state. 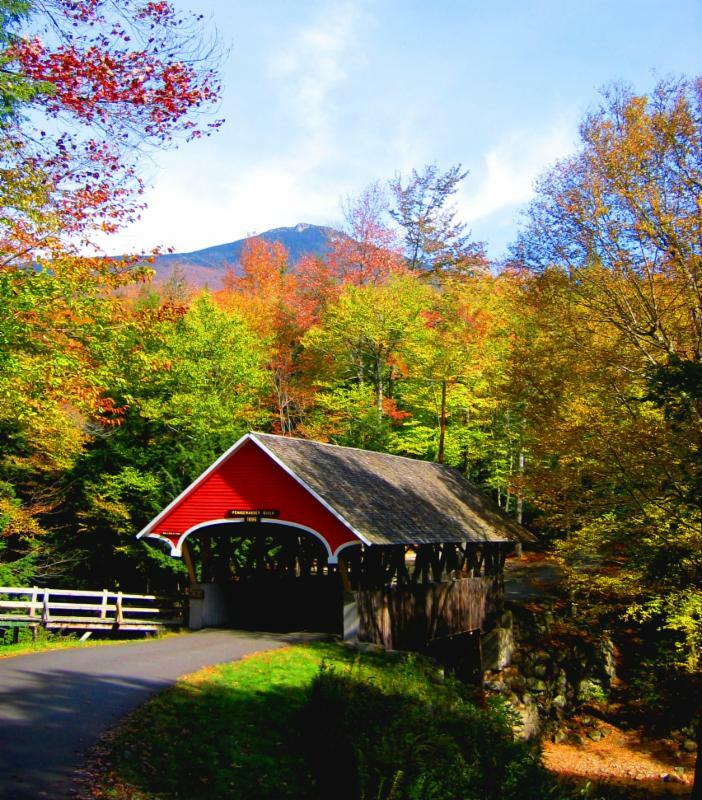 And, up Woodwards way, historic wooden covered bridges are a main attraction for riders–along the Kancamagus Highway and the White Mountains. MotoUSA has a great and informative article about author Bryan Harley’s covered bridge excursion during a recent motorcycle week that we recommend to anyone planning the trip. Woodwards Resort welcomes riders and is pleased to offer Free Breakfast if you stay two or more nights. Come play and stay with us!